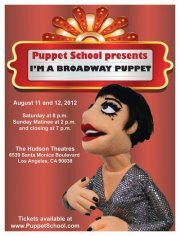 On August 11 and 12, 2012, I went to a puppet show called I’m A Broadway Puppet at The Hudson Theatre in Hollywood. It was the graduation show for the new batch of Puppet School students, featuring 14 songs from musical theater classics like A Chorus Line, The Sound of Music, and Hairspray. After doing Puppet Jukebox last year, I was thinking a musical theater one would be the natural progression, but instead we had Puppet Jukebox II. So when I was told that the new batch of students were doing a Broadway one, I was not surprised at all. And the musical numbers lent beautifully to a puppet show. Seriously, these songs already had so much built into them, such as a collection of very distinctive characters, the progressions of different rhythms, a plot, and even some choreography. And many of the pieces were big ensemble pieces, which certainly made the show quite an ambitious one. That Face: This love song from The Producers becomes a hilarious and very adorable one when the beautiful Ulla Inga tor Hansen Benson Yansen Tallen Hallen Svaden Swanson was played by a monster with sharp teeth. But oh well, love was love. It was a simple piece with only two characters but the movements and interactions between the two characters were simply a delight to watch. Skid Row (Downtown): This song from The Little Shop of Horror was quite catchy and was stuck in my head for days. (Actually, multiple songs from the show got stuck in my head, taking their turns, such as At the Ballet from A Chorus Line, and Seasons of Love from RENT.) And it was beautifully performed by many very talented singers. Welcome to the 60s: This song from Hairspray was something I was a little partial to since we did use this song for an exercise in class, but it was such a happy, cheery song! And this one was a fun rendition. But I guess they’ve also been hit by the economy. The Dynamites were downsized from three to two. It was a really fun show. The two friends that went with me actually both signed up for classes afterwards. They really need to give me some commission, hm. Oh, and did I mention that the show was so much fun that I watched it twice? The show starred Marky Andrews, Ray Busmann, Leah Calote, Zachary Crook, David Dobrow, Michael Earl, Keith Ferguson, Steven Fletcher, Rachel Herrick, Will Kistler, Jennifer Kekumu, Libby Letlow, Josh Livingston, Constanza Mazeau, Tod McClain, Russell Nauman, Janine Pibal, Aiysha Sinclair, and Amy Smith. Congratulations to all the puppetmasters who performed this show!!! This looks really interesting, Kelvin. Do you have clips of the Puppet Jukebox performance? Particularly one with you doing the vocals? Chris, I don’t have a clip of myself but here are a few videos from the show. I’ve been trying to find video of the aforementioned “I’m a broadway puppet” show, since I was unable to attend. Did anyone manage to get a few clips? Would LOVE to see them. Hi Charles, I believe the school taped it. There might have been other people taking their own videos as well. Unfortunately, I have not seen any that’s uploaded publicly. (I am sure eventually they would at least post one or two videos.) I know like 17 out of the 20 performers so if there’s such a video online somewhere, it’s likely I would’ve come across it by now.